And we truly are back. 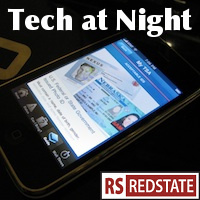 Friday night was a night off thanks to some maintenance at RedState. It was nice because I could rest on a Friday night… but it’s not so nice now when I have a whopping 20 Firefox windows to sort through tonight. So here we go. With so many big stories going on, it’s hard to pick which one to start with. So I’ll start with the one that may be under the radar more than the others. The FCC refused to declare the wireless market competitive in its annual report required by the [Correction: OMNIBUS BUDGET RECONCILIATION ACT OF 1993]. This is a ridiculous position to take. Despite obvious, quantifiable proof that prices are lower, service is better, and choices abound, the FCC has refused to admit the market is competitive for ideological reasons. After all, if the FCC finds the market competitive, it can’t give itself permission to regulate further. Just more proof we need FCC reform, joining the long list of existing reasons. Frogmarch watch continues: As law enforcement investigations and arrests have continued in at least four countries, including the reported arrest of its leader, Lulzsec has punked out. And while it’s absolutely shameful that Joystiq would even imply the group was a “gray hat” organization rather than just another criminal gang, it is now we who are laughing at Lulzsec’s insecurity since 2001. More and more information comes out about the group, and you bet your router that the FBI, CIA, NSA, and every other organization around is scooping this information up, plus more we don’t know about. The frogmarches are only a matter of time, punks. Just like they got the guy who broke into AT&T’s iPad data. To think I’m not even done with what I consider the big stories! It turns out that The FTC is taking a page from Dilbert (which isn’t a great sign for any government policy) and going after Google. I can’t say that I’m shocked about this. Still, I don’t think anyone in the tech industry wants more regulation. Yet, if the FTC investigation bears fruit, then not only will Google get more rules to live by, but there will likely be a spill-over effect, too, to other players in the industry. Oh, well. The Internet was nice – and free – while it lasted. Uncle Sam was bound to extract his pound of flesh at some point. As the “public interest” lobbyists are wont to say – “The Internet is too important for companies to control.” Of course, companies like Google didn’t help themselves (or us) any by funding those loud groups, as well as pushing for Internet regulations like Net Neutrality, among other pro-government takeover activities. Conservatives must put country over partisanship and defend Google in this. This is a fight over the scope of government, and especially the scope of government online. This is a fight where every single conservative activist online stands to lose big, should Google lose. So I call upon Mike Lee and other Congressional Republicans to oppose efforts to pressure the company. There are basic principles at stake, principles more important than whether or not we like Google. Likewise, there are fundamental principles at work in the AT&T/T-Mobile merger. Which is why I’m perfectly happy to see the left splintering in its opposition. The National Hispanic Foundation for the Arts has backed the deal, as have 76 House Democrats. Time to get it done. Back to the FCC, I’m guessing the two new members really will end up a package deal, especially if a Republican staffer ends up being the Republican member in the deal. It will be interesting to see if the new Democrat ends up as much a puppet of the Soros-funded fringe as Michael Copps has been, though. It’s nice to see Virgina AG Ken Cuccinelli suing the FCC over Net Neutrality. I’m guessing not much will come of it, since as far as I know the regulations still haven’t hit the Federal Register. But as a sign of things to come, it’s welcome news. Once again, it’s sad news when both Texas and California are rushing to tax and spend, in a transparent attempt to pick winners and losers in the retail marketplace. Amazon is too successful. Punish it! Tax it! Sad as it is, I’ll still laugh if we don’t even collect the $200 million allocated for enforcement. I adamantly oppose the PROTECT IP bill, which creates a national censorship blacklist in the name of protecting copyrights. No matter how laudable the goals, I cannot see expanding government in this way as having any good outcomes. Others disagree, and see “DNS Filtering” as a good thing. I would argue that any comparison between PROTECT IP and spam filtering is inappropriate, because the former is government censorship, while the latter is a simple exercise in property rights. The two are fundamentally different, but read and judge for yourself. Quick hits: Samsung may be losing the opportunity to make iPhone, iPad, and iPod chips because of its iPhone copying. Oops. The Supreme Court threw out California’s video game censorship for the children, ruling in Brown v EMA that it violated the First Amendment by a 7-2 vote. I love video games, but I agree with Justice Thomas who with Justice Breyer dissented, putting the rights of parents first, and showing that they are not in conflict with free speech. I also love poker, but I’m wary of new poker bills. I can’t support an expansion in government, even if Joe Barton is behind it. The next time a socialist tells you that “basic research” in Science! must be funded by the government, laugh and ask why all that research is hidden behind private paywalls.